The Philippines Public Attorney’s Office (PAO) said it would seek murder charges on Friday against three anti-narcotics policemen whose killing of a high school student last week has triggered rare public outrage about the country’s fierce war on drugs. 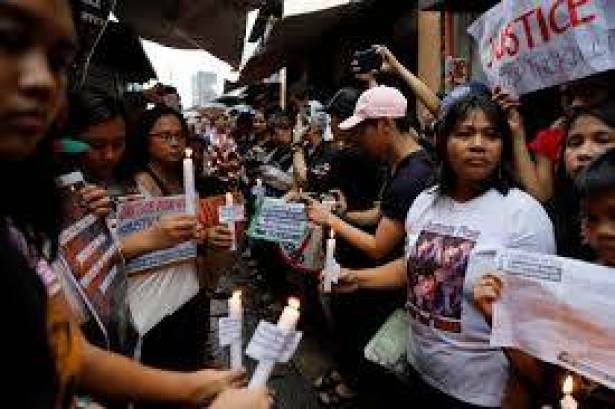 The death of 17-year-old Kian Loyd delos Santos on Aug. 16 in a rundown area of Manila has drawn huge domestic attention to allegations by activists that police have been systematically executing suspected users and dealers, a charge that authorities deny. Persida Acosta, the head of the PAO, said the complaint against the three policemen would be forwarded to the justice department on Friday. Security cameras showed the officers aggressively escorting a man matching delos Santos’ description towards the area where he was killed. The three policemen admit they were the people shown in the video, but that they were escorting another suspect, not delos Santos. “It was cold-blooded murder, he was shot while kneeling down,” Acosta told news channel ANC. Delos Santos was among more than 90 people killed last week in three nights of intensified raids dubbed "One Time, Big Time", which had Duterte's steadfast support. The term refers to a coordinated police drive to stamp out crime in a particular district. The teen's killing puts focus on Duterte's repeated promises to police administering the crackdown that he would insulate them from any legal consequences. Critics say his rhetoric is tantamount to giving police a license to kill.